Johnny Nevin: Can you tell us what we’ll be seeing at the Noumenon Dance Ensemble Spring Preview — about some of the works that you’ll be performing, and about the choreographers and the company? Alia Simon Montijo: Noumenon Dance Ensemble (NDE) is an exclusively female dance company, resident on the northwest side of Chicago at Dance Avondale. Its mission includes the support and upward mobility of women and other minorities in the professional dance arts. In its upcoming concert Spring Preview, NDE will premiere 4 new pieces of repertoire commissioned between January and April, 2018 by female choreographers. Each new piece explores a different theme brought to life through different movement techniques and qualities. By the versatility and capability of NDE dancers, Spring Preview includes jazz, Horton-based modern, and partnering techniques. NDE is a unique voice in the Chicago dance scene because of its staunch commitment to its mission; the all-women cast of dancers, directors and choreographers provide a platform for the safe exploration, creation and presentation of art from the female perspective. Spring Preview will feature the work of NDE choreographers: Kristi Andarcia, Kristi Licera and Alia Montijo with guest dance company South Chicago Dance Theater and live musical accompaniment from revered Burlesque singer and producer Brooklyn Britches. Choreographically, I feel tremendous motivation to create work that reflects the impact of the strength of community. Johnny: At Dance Avondale and the resident Noumenon Dance Ensemble, you seem to be especially involved in the community that surrounds you. Can you tell us a little more about this relationship? What kind of impact does your community involvement have on the choreography that Noumenon Dance Ensemble develops and presents? Alia: I inherited NDE in August 2015, and at that time I decided to channel my humanitarian drive towards a dance company exclusively for the achievement of women, mothers who are practicing artists and other minorities who’s voices are under-represented in the professional dance arts. Over the past 3 years, NDE has upheld this mission and I felt compelled to expand the reach of the mission. By partnering with the Chicago Park District, NDE created Dance Avondale, a dance studio committed to providing the highest quality of dance education that is available to all interested students by being financially accessible and culturally sensitive. Avondale is predominantly working-class neighborhood, rich in diversity and 2/3 of all inhabitants have children under the age of 18. Dance Avondale was created to serve this population and in-turn help to expand the demographic of private-studio dance education. Choreographically, I feel tremendous motivation to create work that reflects the impact of the strength of community. My new choreographic work premiering at Spring Preview called They Tried to Bury Us (They Didn’t Know We Were Seeds) is an artistic manifestation of the power of minority voices joined in solidarity. 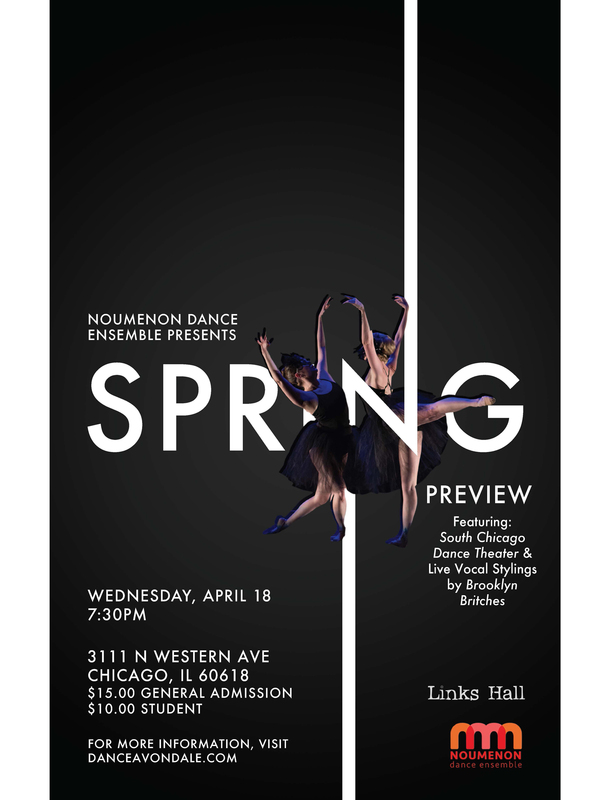 Noumenon Dance Ensemble will present their Spring Preview on Wednesday, April 18 at 7:30pm at Links Hall, and tickets are available online from Links Hall.